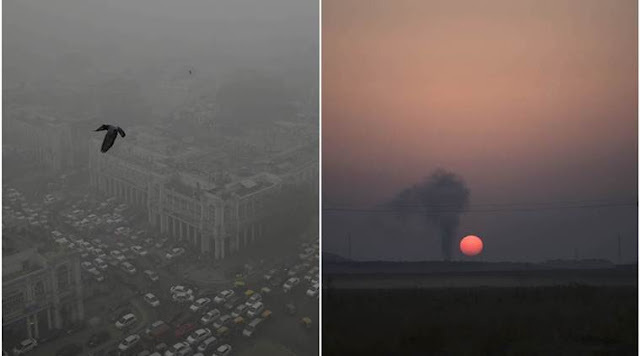 The Indian government has declared lingering, severe levels of toxic air over its capital city an "emergency situation" as Delhi administrators announced a plan to temporarily shut construction sites and a coal-fired power station to bring pollution levels under control. Schools in the city will be closed for three days and traffic may be rationed after six days of heavy smog and concentrations of harmful particles so high they cannot be measured by most air-quality instruments. The level of PM2.5 pollutants - the most harmful because they can reach deep into the lungs and breach the blood-brain barrier - have routinely reached at least 999 in parts of the city this week, a reading literally off the charts and more than fifteen times the safe limit of 60. Delhi's chief minister, Arvind Kejriwal, announced emergency measures on Sunday to protect the city's inhabitants, including a five-day ban on construction and demolition, thought to be a major contributor the city's noxious atmosphere. Bulldozers would also be used to put out fires at the enormous Bhalsawa landfill in the city's north-west, that constantly smoulders from small fires. "People should stay home as much as they can [and] work from home," Kejriwal added. A major coal-fired power station in Badarpur, south-east Delhi, will stop operating for 10 days, as will any diesel generators in the city. Kejriwal has also called on the governments of neighbouring states to enforce laws against burning agricultural waste. Around this time each year, hundreds of thousands of farmers in Haryana and Punjab set their fields on fire to dispose of crop remnants, which sends smoke billowing across India's northern plains. The Delhi government is also preparing to re-introduce a temporary scheme to only allow cars to drive on odd or even days, depending on the last digit of a vehicle's registration number. Airborne pollution in Delhi rarely dips to safe levels, even during the summer, when winds are stronger and dust and droplets disperse more easily in the hot air. It is traditionally worst in the winter months, beginning with the festival of Diwali, when hundreds of thousands of fireworks are let off across the city. They leave a haze that usually lasts two or three days, but this year it has not abated almost a week later.